The Rothman Institute Ice Rink at Dilworth Park, Tuesday, Nov. 21, 2017. This weekend is full of activities all ages can enjoy. 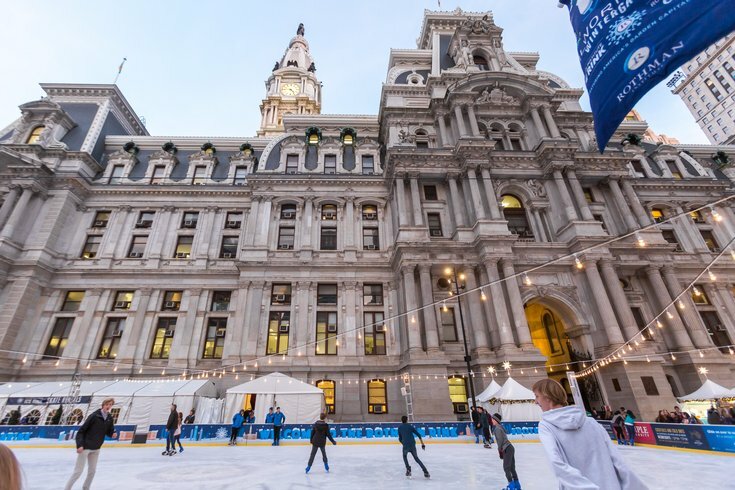 An ice rink in the heart of the city will open for the winter season. Mrs. Claus will visit a quaint, suburban shopping destination. You may see a ton of Rocky Balboa impersonators Saturday. And a world of imagination awaits at the Academy of Music. Get all the details on what's happening in our roundup below. Friday evening, the rink outside City Hall will officially open for the season. To celebrate, there will be ice sculptors, snow, firework effects, fire performances and figure skating. After skating, warm up in the tent next to the rink with hot chocolate, beer or cocktails. Holiday festivities begin Friday evening at Peddler's Village in Lahaska, Bucks County. Mrs. Claus will make an appearance to lead a parade through the outdoor shopping center to a tree lighting ceremony. The family-friendly event will also include complimentary ornament-making, hot chocolate and cookies. There's still time to register for Saturday's Rocky Run. Choose from the 5K, the 10-mile run and the 13.1-mile Italian Stallion Challenge. Each course begins and ends at the Philadelphia Museum of Art, but no one has to race up the art museum steps like Rocky Balboa. Catch a performance of "Charlie and the Chocolate Factory"
On Tuesday, Roald Dahl's amazing tale debuted at the Academy of Music. The production includes songs from the original film, including "Pure Imagination," "The Candy Man" and "I've Got a Golden Ticket," alongside a new score from the songwriters of "Hairspray." Tickets for the opening weekend start at $25. Check out the full lineup of Broadway Philadelphia shows here.